Your body is your canvas for tattoo artwork. The large areas on your back, chest, and stomach are ideal locations for major pieces of artwork, but never underestimate the power of the arm as a great place to ink a major tattoo. Tattoos on the arm can either be a ‘Full Sleeve’ (covering the entire arm) or a ‘Half Sleeve’, in which the tattoo covers the area from shoulder to elbow, or just below it. Half sleeve tattoos are becoming more and more popular, as people realize that it is not necessary to go for a ‘full sleeve’. To those who believe that a half sleeve tattoo looks incomplete, they had better start thinking again. For modern tattoo artists, such as we have at ALL DAY Tattoo studio, the upper arm area – shoulder to elbow – provides the artist with tremendous scope to ink something really stunning. If you struggle to find the necessary time to ink a great tattoo, another plus for the half sleeve is that it takes much less time to complete than a full sleeve. The average time to ink a half sleeve tattoo is estimated to be around three sessions totalling from 9-15 hours depending on the design – still quite a commitment, but much less than the time to ink full sleeve, which can take anything from 25 to 40 hours to completion. Half sleeves have the added advantage of being easily concealed if circumstances demand it. If you’re in your workplace, then your tattoo can be hidden from your boss, co-workers or clients/customers and so on. This is something that is much more difficult – in fact nigh on impossible – to do with a full sleeve. Traditionally, half sleeve tattoos used to be the province of bikers, rock stars, and bodybuilders. This is because tattoos on the upper arm are a great place to focus the eyes on the wearers’ well-developed biceps. Many tattoo artists know just how to create a design that can show off these bodily assets. Who are ideal candidates for a half sleeve tattoo? Obviously, there is the traditional base of men with large biceps and triceps, but increasingly, half sleeves have not only become popular for a wider range of men, but also for a large number of women. Yes, it’s true – half sleeve tattoos are trending – for both men – and increasingly, women – thanks to the proliferation of exciting and creative designs that do much more than just highlight those big masculine upper arm muscles. However, don’t forget that any proper half sleeve tattoo is a major commitment. Bear in mind that most half sleeve tattoos will be an extensive and major piece of artwork, probably involving intricate, often heavy ink strokes, and will likely contain many shades or colors. So choose carefully before committing yourself to your chosen half sleeve, as it will be very difficult – if not impossible to remove at a later date. This is all the more reason to come to All Day Tattoo, where you can be assured of expert advice and the finest possible artwork. What sort of half sleeve designs are trending? 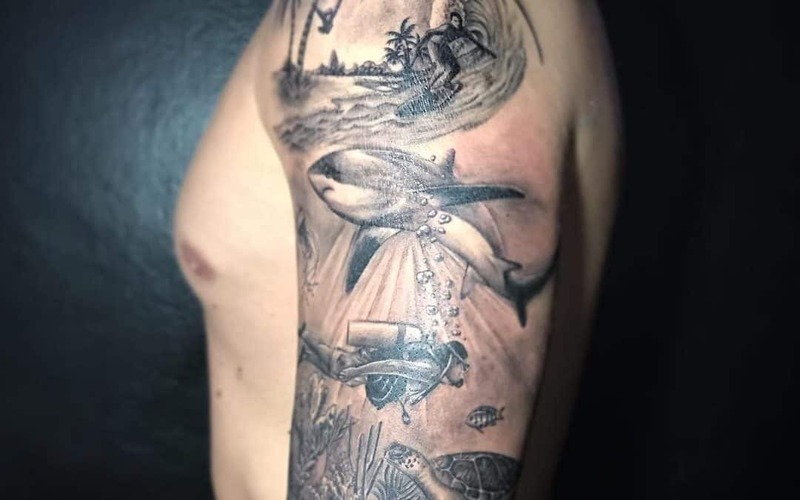 As with any tattoo – the world is your oyster, only limited by your and your artist’s imaginations, and in recent years we have seen some really stunning and often idiosyncratic artwork on the upper arms. A half sleeve tattoos can be so intricate with such detailed backgrounds that at a distance they are often mistaken for real material. For men there are the traditional designs, such as dragons, skulls, tribal maori and polynesian designs; and for women, designs such as intricate flowers, a lighthouse watercolor, and angels are becoming popular. It is easy to get a complex design wrong and we will be only too happy to set you on the right track – whether or not you choose to have your tattoo inked at our Bangkok studio. So why not click on the link below for your free, no-obligation consultation with one of our expert artists. Bring along your ideas, take a look at some of ours, and together we can decide what will work best for you.